False lashes are one of my favorite ways to spruce up an eye look. Sporting false lashes not only play up the eyes, they also add a stunning glam factor. I have always admired false lashes, but I would often have a hard time applying them. No matter what I did, I just couldn't get the hang of it. I gave up on them for a bit, but with a little more practice and a few tips and tricks I learned along the way, I am finally applying them properly. Now that I have the false eyelash application thing figured out, building up my false eyelash collection was inevitable. I ordered a couple of Miss Adoro and Red Cherry lashes from Lady Moss, which have a lovely array of false lashes at major bargain prices. I have tried a couple of Red Cherry lashes before (I picked some up at IMATS back in April) and I am a huge fan of them, so of course I had to pick up a couple pairs-my favorite are the #47. Red Cherry lashes feel so lightweight on, and the hairs are super soft and of nice quality. 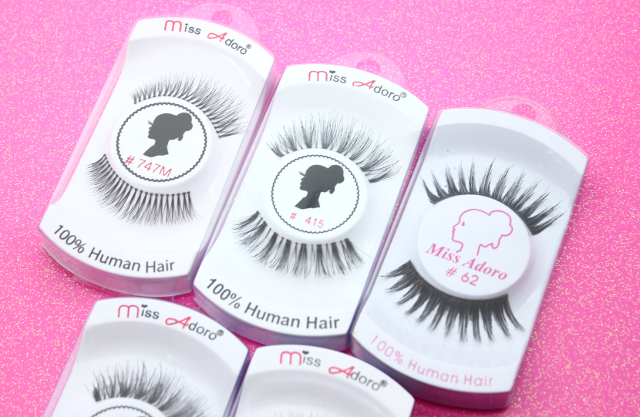 This will be my first time trying Miss Adoro lashes and I am really looking forward to sporting them. The hairs feel soft to the touch, and they look like they are going to be weightless on. I have a feeling I am going to love them! Which are your favorite false eyelash brands? Sooo gorgoues! I love how full, natural and curled these lashes are! I must order some soon! I don't have a favorite brand because i buy a bit from each brand I want to try from. However my favorites are from a Taiwanese brand ( i think) called Stellar, they have hundreds of designs!